Based in Philadelphia, Kline & Specter, P.C., is one of the pre-eminent personal injury law firms in Pennsylvania and across the country. Backed by a strong tradition of successful litigation, Kline & Specter, P.C., has achieved more eight-figure verdicts and settlements than any other personal injury firm in the city. If you have been hurt in an accident and are considering a lawsuit, it pays to have a skilled personal injury attorney on your side. 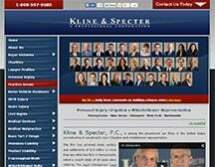 The attorneys at Kline & Specter, P.C., offer comprehensive legal representation across a broad range of practice areas, including medical malpractice, whistleblower protection and product liability. No matter how challenging your case may be, Kline & Specter, P.C., has the resources and experience necessary to provide exemplary legal service. The firm’s reputation is backed by awards and recognition from across the country. The firm has been selected as one of America’s Elite Trial Lawyers by The National Law Review. The firm has been named one of U.S. News Media Group’s Best Law Firms. Founding attorneys Tom Kline and Shanin Specter have been accepted into the International Academy of Trial Lawyers, an organization whose U.S. membership is limited to just 500 lawyers. Attorneys Kline and Specter have also been accepted into the American College of Trial Lawyers, an achievement reached by just 1 percent of lawyers. If you have been injured due to another party’s negligence, get help from a lawyer with a proven record of success. To schedule a free initial consultation with one of the attorneys at Kline & Specter, P.C., contact the firm by phone or email. All cases are taken on a contingent fee basis – the firm will never charge fees unless you recover compensation in your case.